Nerf always has more equipment every year. It is never just a rapid shooter, additional body armor has been developed to make the action more exciting. 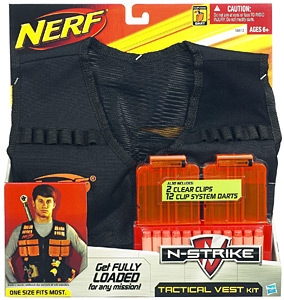 The tactical vest comes with a dozen clip system darts. It contains easy storage for more darts. A tactical light can be affixed to the rails of all the N-Strike toys including the Hornet, Nite Finder, Longshot, Recon, and Maverick Nerf dart systems. The light is green and illuminates night-time maneuvers.